On Wednesday this week, California Governor Jerry Brown issued an executive order instituting the first mandatory water restrictions in response to the state’s historic drought. Replacing lawns with drought-tolerant landscapes. Providing incentives for replacing water-inefficient appliances. Restrictions on urban irrigation with potable water (new homes and buildings and street medians). While the executive order included provisions related to agricultural water use, they mostly involved planning and monitoring, rather than the mandatory reductions that urban water uses face. The majority of water-saving measures targeted urban and residential water use. California faces severe water shortages, and urgent response is needed. While these measures appear bold and significant, they fail to address our most significant discretionary water use. They amount to conservation theater — providing the appearance of meaningful drought response while providing only token water savings. The urban and residential focus of recent water conservation efforts keeps us from making meaningful progress toward reducing our water footprint. The majority of our water use is agricultural. Serious responses to the drought will have to include agriculture. By restricting our focus to the 20% of urban water use, we are drastically reducing the impact that our response will have. Excluding agricultural water use from conservation efforts is often justified by remarking that “people have to eat”. While this is true, that does not mean that agricultural water use is sacrosanct or beyond scrutiny. Some foods are water efficient, and others are water intensive. People have to eat, but they do not have to eat the diet we eat today. A policy of encouraging water-efficient foods, and discouraging water-intensive foods, could substantially reduce our agricultural water footprint. 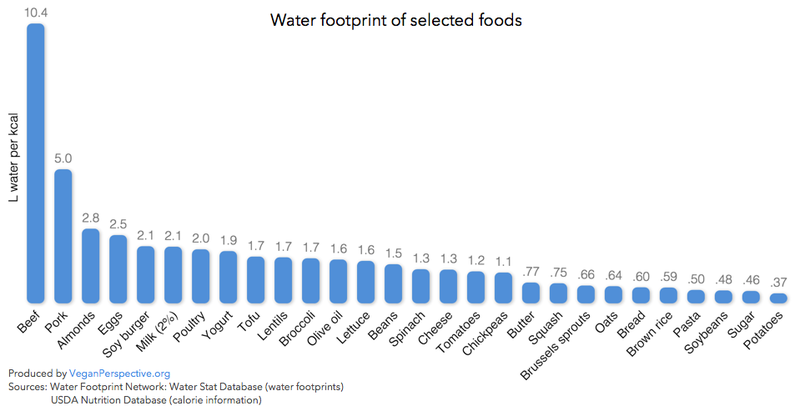 The most water-intensive foods are animal products, and especially meat. Americans eat a diet that is unusually high in animal products — 30% of calories from animal foods, compared to a global average of 20% — which causes our diet to be unusually water intensive. The high water footprint of meat reflects feed inefficiency. Since eating meat is eating an extra step up the food chain, you lose ~90% of the energy that the animal consumed during their lifetime. Eating animals who ate grains and legumes is necessarily less efficient than eating grains and legumes directly. The additional crops that must be grown and irrigated translates to an increased water footprint. If we replaced these animal foods with more water-efficient plant foods, we would substantially reduce our agricultural water use. There is ecological literature exploring this idea. For instance, in this paper, Hoekstra compares an omnivore and vegetarian diet, and finds that the vegetarian diet reduces agricultural water use by 36%, saving 1300 liters of water per day. 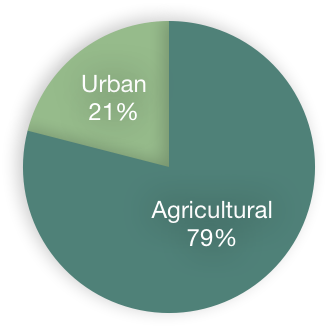 Extrapolated to California, vegetarian diets would reduce our total water use by 28%, compared to the 5% reduction provided by the urban use targets outlined today. (6) This has more than five times the impact, and provides greater water savings than reducing all residential, commercial, industrial and municipal water use to zero. California’s recent drought is considered a local and temporary phenomenon. However ecologists predict freshwater shortages in the next twenty years that will be both global and persistent. In a report prepared for Stockholm International Water Institute’s World Water Week conference in 2012, current levels of global animal product consumption are described as an “impossible alternative” for the future. According to these researchers, there will be no way to provide enough food to avoid mass starvation with the amount of water available, if we choose water-inefficient animal products. This is alarming, since the US already consumes a 50% greater fraction of animal foods than the global average (30% versus the 20% global average), and rates of animal product consumption are projected to increase rapidly as developing nations continue to adopt Western dietary practices. The paper concludes that only a combination of a vegetarian diet and a well-organized system of international food trade would we be able provide enough food to avoid famine with projected water supply. Even if we muddle through the current California drought without substantial changes, we will need to make better use of our water resources in the coming decades if we are to avoid widespread famine. An evidence-based water conservation strategy would focus on agricultural water efficiency and diet choice. While other strategies that reduce animal products may work, vegetarianism would be a logical choice of diet for this purpose. It has an ecological literature supporting it, both for water conservation and for reducing climate change impact, and it is well-understood nutritionally. This intervention would pose minimal risks, and would likely confer health benefits. By focusing primarily on household and urban water use, we’re reduced to making marginal changes with negligible impact. For instance, in response to drought, the public is encouraged to take shorter showers, which could optimistically save 30 liters of water per day. Why is the public not encouraged to avoid meat, which could realistically save 1300 liters per day (equivalent to three and a half hours of showering)? Some may argue that moving toward a vegetarian diet is not realistic, or that people will not accept making such a change. I would argue that this is partially informed by a cultural bias against vegetarian diets. There is a long history of nations shifting their diets away from animal foods, often rapidly, in response to ecological stress, economic conditions, or wartime rationing. In one famous example, occupied Norway’s livestock was diverted to the German war effort during WWII, immediately removing most animal foods from the Norwegian diet. The decline in heart disease that resulted was one of the key data points that prompted research into diet and heart disease in the following decades. Whether or not we choose to eat fewer water-intensive animal foods, we must recognize that this is a choice. We cannot claim that that we can’t reduce our agricultural water footprint because “people have to eat”. We must accept that we choose not to reduce our agricultural water footprint because of what we choose to eat. Serious droughts require serious solutions. If we truly intend to address our water consumption, we will have to eat as if water matters, and choose water-efficient plant foods. A 25% reduction in urban water use (which is 21% of overall water use) yields a 0.25 * 0.21 = 0.525 = 5.25%. This is a token reference. There is a robust literature on vegetarian diets and health. Typical American showers use 65 liters of water total, and last 8.5 minutes. Limiting to 5 minutes, per common drought management advice, yields a difference of: 65 – 65 * 5 / 8.5 = 65 – 38.2 = 26.7. I use 30 as an approximation. A detailed comparison of a soy burger and soy milk with animal product equivalents. This is a token reference for how out of proportion the public response to almond water consumption is. Almonds, while not a water-efficient food, use less than a quarter of the water that California’s pasture and feed crops use. Reducing almond consumption is a reasonable drought response. However this only makes sense after we eliminate much more inefficient foods (and therefore higher drought mitigation priorities), such as beef and pork. For some reason, rice often comes up in these conversations. This gives some context as to why rice is so water-efficient on the graph above. In the US, local rice is much less water efficient than rice grown in Asia (ideally during the rainy season). The US is less humid, leading to more evaporation losses.